Designing cabinetry is a little like having a baby. It's a long several months. Sometimes things go smoothly, but other times clients aren't quite sure what they want, so the design process takes awhile. But, when the project is finished and everything comes out well ... no ... better than you thought, then it's all worth it. It was due to September 11th that I got into the kitchen design business. You might remember we had a little recession after and since I had been designing $3000+ custom closets and no one was buying them at that time, I applied for a temporary job at the Home Depot and the General Manager thought I'd be a good kitchen designer since I had designed custom closets. He sent me to their Kitchen & bath design school. After working at HD, I went on to work at smaller cabinet company & have worked with the same people at another place. With eight years of design project you might think my portfolio would be filled with photos. But, up until the summer of 2008, we were insanely busy so we didn’t take the time. I hope you like the ones I do have. love putting large pot and pan drawers in a kitchen whenever the design allows. They are so much more functional than roll out shelves inside a cabinet because there is only one step to get out what's inside. This Master Bath goes with the kitchen above. I hope that the people who bought this house were tall because the vanity should be shorter with a vessel sink. The builder hadn't ever used one before and didn't know that the vanity had to be shorter when he ordered the sinks. I love the casual feel of this kitchen. All of the bump ups and outs keep it interesting. This kitchen was much more affordable than most due to the door style. The large drawers on either side of the cooktop make this kitchen very practical. The bump ups and outs break up the long run of cabinets. I only designed the big island on this one. 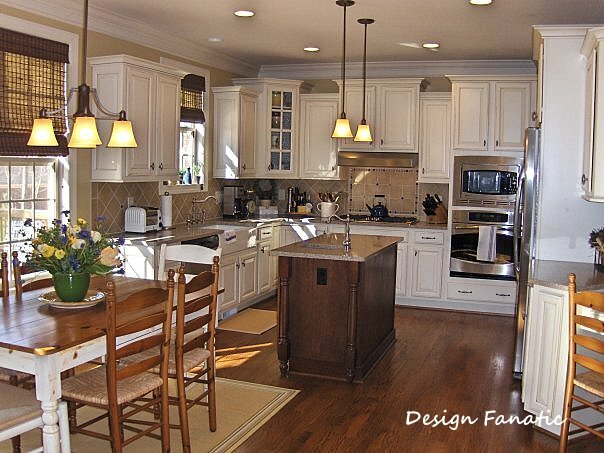 The house had been on the market for over a year & a buyer saw the house & agreed to buy it only if the multi-angled island with a raised bar was replaced with a large non raised island. There is seating on the side opposite the sink, along with a beverage refrigerator, as well. This was my first custom designed island. The four extra large corbels alone were over $1000! I was extremely happy with the way it turned out. P.S. The first one is my favorite design!! Pam, my favorite is the fourth pic down. I knew as soon as I saw it that it was me. I could move right into that kitchen. I think it is because it looks lived in. Those kitchens are beautiful. Pam I can't believe you made your own button, you know how long I tried?? Debbie, making the button was easy in picasa, except I kept losing the text and the location after I saved it. I even tried photobucket, but they don't have very many fonts. I still haven't figured out how to put in the scroll box so people can grab the button. I will have to ask my daughter to do it. She has an awesome myspace filled with all kinds of graphics. She knows how to write the code to make the graphics do what she wants. She's the really creative one in the family... photography, graphic design, fashion & plays the piano. 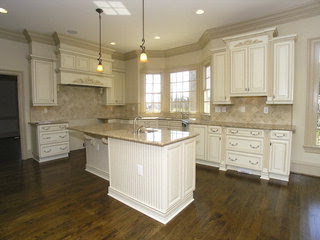 What beautiful kitchens! I especially love the one in the 5th photo down. It looks so warm and inviting! The one with red walls is gorgeous, too. Great job!! All of the kitchens look fantastic. I looks like you've found your niche, because you're obviously very talented at this. Beautiful! I love kitchen designs. I love bathroom designs, too. Heck I love all designing. You name it I want to do it. Love your kitchens I think my favorite is the all white one with the beautiful wood floors and the great natural lighting. The seventh and eighth pictures. Beautiful. These are all leaving me a bit speechless. I would DIE for any of those kitchens! Unfortunately, my space is so small, I don't think any of them would work! So sad. But, I definitely will keep them in my "dream" folder. You're very talented! I love them! All of the kitchens are lovely! I cannot wait until I can overhaul my kitchen. Luckily, I have tons of very nice cabinets, a good layout, and a lot going for it. I just don't like the finishes. Paint, new countertops, a new sink, and new floor and this kitchen will be a dream. Some day... Anyway, you do wonderful work. Thanks for sharing it with us. All gorgeous! I love the casual one w/all the bump ups and outs. 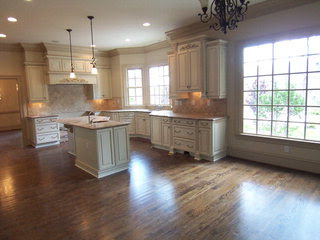 i enjoyed touring and drooling over these kitchens. am considering taking down a wall btween kitchen and living room and having a multilevel island to hide the toaster from view. thoughts on this? looks like most of these are one level. Oh my....what I would do for one of those! I really love your kitchen designs! They're all beautiful, but being a simple girl with no budget, I like the 2 simple ones the best! I would so love to do what you do! Thanks for posting these beautiful pictures! Boy there are some nice choices here! The last is my favorite, but I'm a traditionalist and I love the classic look. 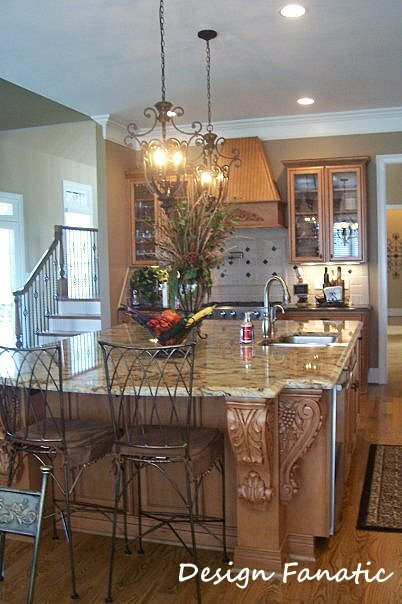 The island and corbels are to die for! The first one is also interesting, I like french and that one seems to hit that feeling nicely. I also like the off white kitchen with the wood floors, it's timeless! I have a hard time with the bump outs and the ins and outs, it gets too busy for me, but you did a great job on that one with the red walls. I would love to do what you are doing too! Oh my Pam! You are very talented and I can see I will enjoy stopping by top visit!